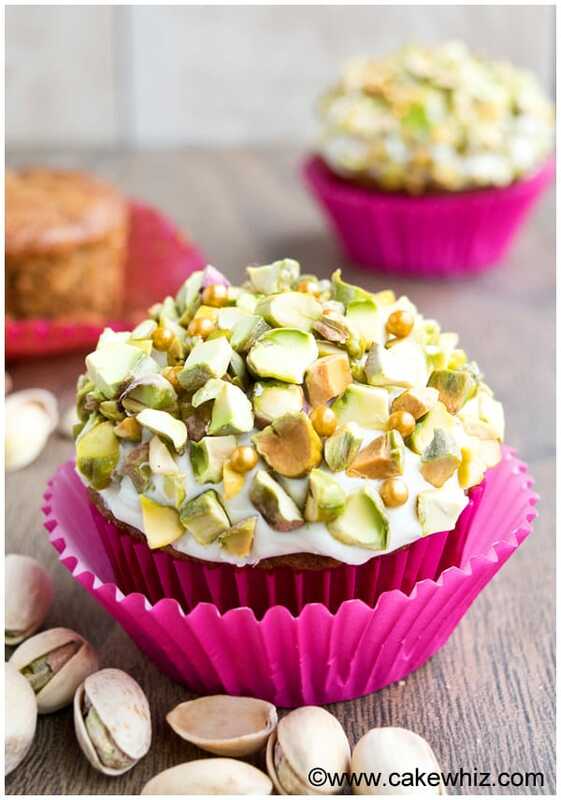 These tender and spiced pistachio carrot cupcakes with cream cheese icing have all the flavors of a classic carrot cake but in cupcake form. Easy to make! Each of those ingredients bring something extra to your cupcakes but I urge you to EXPERIMENT yourselves and figure out exactly what you like best. 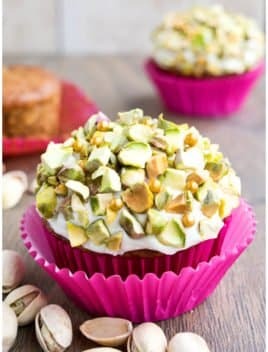 My FAVORITE are pistachio carrot cupcakes. I honestly think that raisins, walnuts or pineapples taste fine in cakes but NOT it cupcakes. Cupcakes are much smaller and those ingredients, together, become OVER-WHELMING! There’s just too much happening at once! However, I LOVE pistachios and I feel like they COMPLIMENT the spiced carrot cake flavors perfectly. Now, I don’t add them into the cupcake batter coz they would get weird and soggy… EWWW! lol. 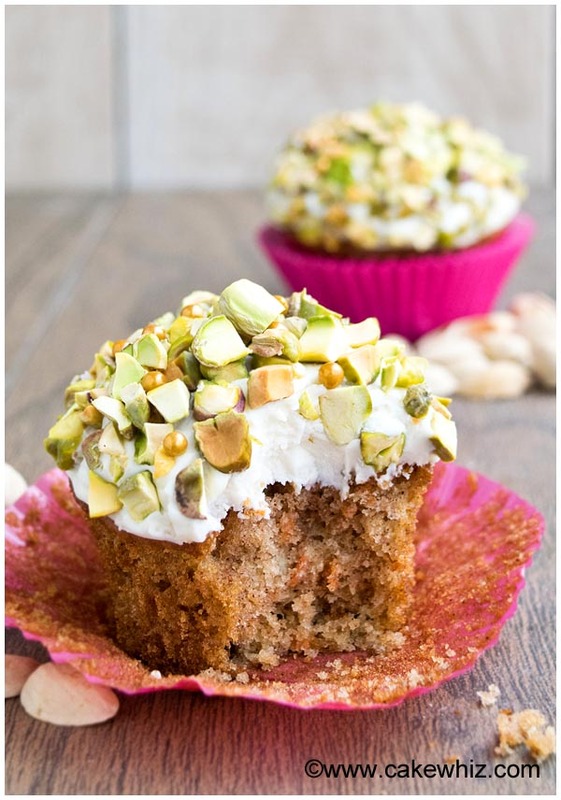 Instead, I like to frost my carrot cupcakes in cream cheese icing and cover them fully in chopped up pistachios…YUM! I used Vital Proteins collagen peptides in this recipe so as to increase the NUTRITIONAL value of these cupcakes. I ADORE this powder… it’s odorless and tasteless. So, you can use it in most of your recipes without having to worry about anything! You get a BOOST of vitamins and minerals in each bite without even realizing it. 1 cup Carrots Shredded not pureed! In a mixing bowl, add eggs, oil, applesauce, vanilla extract brown sugar and granulated sugar. Mix for two minutes until everything is smooth and there are no lumps. Add the shredded carrots and mix everything, until just combined. In a separate small bowl, whisk together the flour, collagen peptides, baking powder, baking soda, cinnamon powder, allspice and nutmeg powder. Dump this dry mixture into the wet mixture and mix until just combined. The batter will be thick but don’t over-mix! Pour this batter into cupcake liners and bake at 350 degrees for 20 minutes or until an inserted toothpick comes out clean. Add the cream cheese, butter and vanilla extract in a mixing bowl. Mix everything until there are no lumps. Then, start adding powdered sugar, while continuing to mix. Start with 1 cup of powdered sugar and work your way up. More powdered sugar = thicker consistency of frosting. Less powdered sugar- Thinner consistency of frosting. 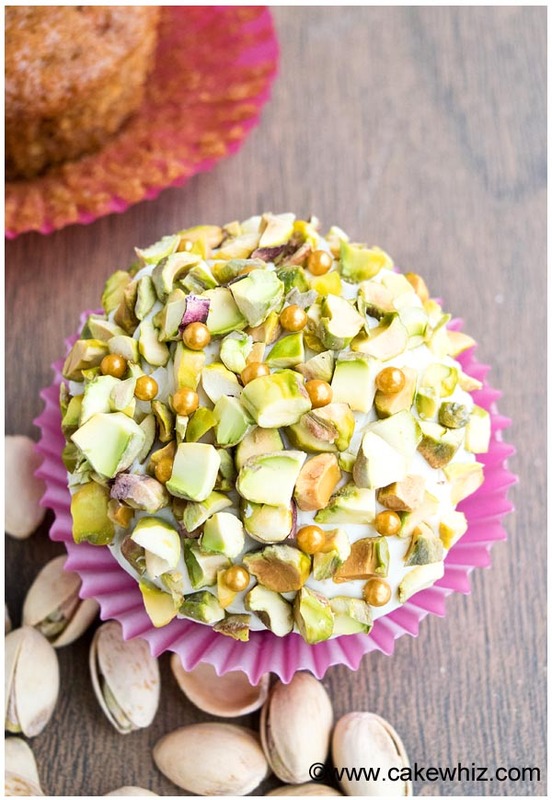 Once the cupcakes have cooled down to room temperature, frost them in cream cheese icing and cover them in chopped pistachios and golden edible pearls. Enjoy! You can add ⅓ cup of mixed raisins, pecans and walnuts into the batter, if you like. 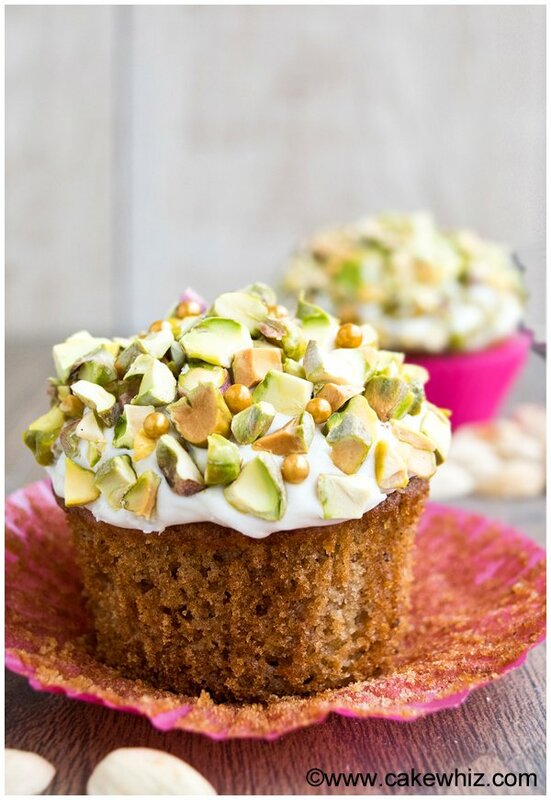 If you are really fond of nutty/chewy cupcakes, you can increase that quantity to ½ cup. Make sure to toss these “add-ins” in some flour so as to prevent them from sinking to the bottom of the cupcakes. I like to add collagen peptides so as to increase the nutritional value of these cupcakes. You can easily order it online. You can also replace protein powder with the same amount of all- purpose flour without any noticeable difference in these cupcakes. Love these cupcakes! Perfect for Easter.. and they look great too. We plan to make these for Thanksgiving. Can I assume the pistachios are UNSALTED? Thank you.